D id you know that at the beginning of the twentieth century, there were two separate Bunnell companies selling telegraph instruments and that they were in competition with each other? 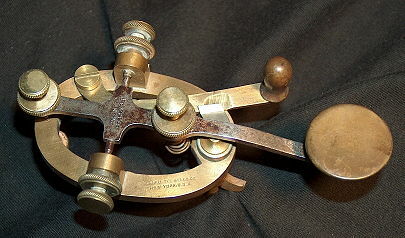 on an aluminum lever of a telegraph sounder. the markings : J.H. 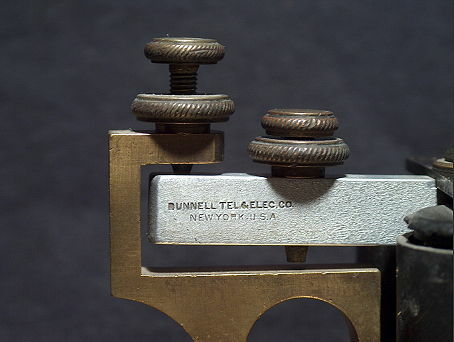 Bunnell & Co.
You may have encountered on occasion the curious markings : "Bunnell Tel. & Elec. Co." inscribed on some telegraph instruments. These instruments look identical to the ones marked, "J.H.Bunnell & Co." It seems that there has always been somewhat of mystery associated with this anomaly. Why would Bunnell go to all the trouble of marketing the same products using another name? All the theories of a spin-off company, or a subsidiary for specialized markets, never seemed to add up. Jesse H. Bunnell was a former Civil War telegrapher. In 1872, he and James Partrick formed the business, Partrick, Bunnell & Co. in Philadelphia, Pa. as a manufacturer and dealer of telegraph and electrical instruments. He was later associated with the New York telegraph manufacturer L.G. Tillotson & Co. In 1878, he started his own company, J.H. Bunnell & Co. in New York City and in 1879, formed a partnership with Charles McLaughlin. History seems to have forgotten McLaughlin and his role in the success of J.H. Bunnell & Co. McLaughlin, like Jesse, was a former telegrapher and his business background was heavy in the construction of commercial and private telegraph lines. He entered the business in 1863 and spent some of his early years constructing the first telegraph lines in Florida with the goal of connecting them with a cable to Cuba. In 1876, he was in Philadelphia as a representative of a New York manufacturing concern when he first met Jesse Bunnell. Three years later they became partners of J.H. Bunnell & Company. As partners they complemented each other very well but operated independently. Jesse's heart and soul was in the manufacturing aspects of the company whereas McLaughlin's interests concentrated on commercial sales and general operations. Jesse passed away on February 8, 1899 at age 56, which made McLaughlin the sole surviving partner of the firm. 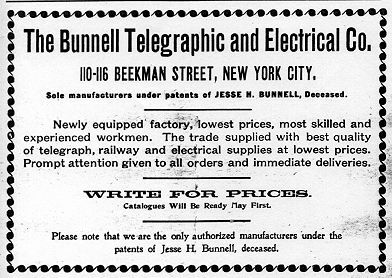 Uncertainty existed as to the future of the Bunnell company after Jesse's death. McLaughlin was quick to reassure the telegraph world by placing ads and business notices stating that their factory was crowded with new work and that business was going to continue as normal. A few months after settling Jesse's estate on October 4, 1899, McLaughlin and four others filed to incorporate J.H. Bunnell & Co. in the State of New York. Using a start up capital of 50,000 dollars, 300 shares of stock were issued and Mclaughlin held the majority ownership with 170 shares. Other major stock holders included Mclaughlin's son William and veteran Bunnell inventor John Ghegan, each owning 50 shares. Meanwhile, Jesse's estate left 300,000 dollars to his family. 30,000 dollars went to his wife and 270,000 went to a trust for his four children. Mclaughlin's move to incorporate a "new" J.H. Bunnell Co. did not sit well with the Bunnell family. Although the family had possession of Jesse's patent rights, they could not stop the "surviving partner" to continue to operate as J.H. Bunnell & Co. 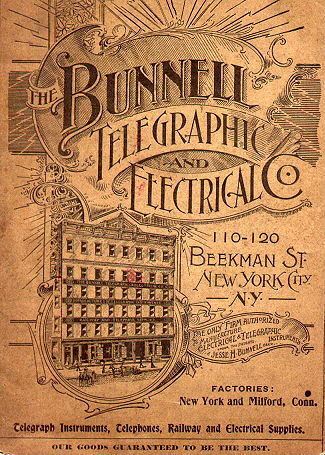 The Bunnell family countered this by incorporating their own company and on January 27, 1900 The Bunnell Telegraphic and Electrical Company was formed with a start up capital of 200,000 dollars. Three of the five incorporators, owning 96 percent of the company's stock were Bunnell family members: Mary Bunnell, (Jesse's widow) Dewitt Bunnell, (Jesse's eldest son) and Albert Wise. (Jesse's son-in-law who held the majority ownership with 61 percent) The new firm set up their sales and manufacturing operations at the buildings covering from 110 to 116 Beekman Street in New York City. On February 10, 1900, the same date of the announcement of the new Bunnell Tel. & Elec. Co. in the trades, Mclaughlin gives notice that because J.H. Bunnell & Co. has "grown to such proportions" they have decided to move into a larger facility and leases 20 Park Place in New York City. This new location gave them a five story building, plus a basement and a sub basement for their offices, show rooms, and a warehouse. 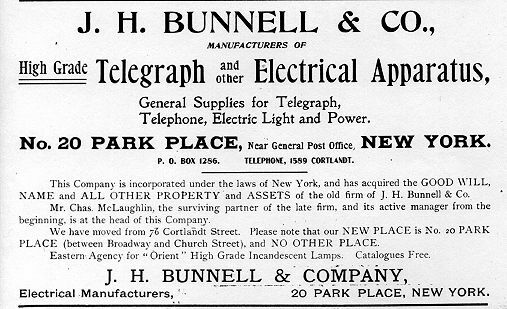 The Bunnell Telegraphic & Electrical Co.
"We own the Good-Will, Name, Copyrights, Trade-Marks and all other assets of the old firm of J.H. Bunnell & Co. and propose to maintain our rights in the premises. Attention is called to these facts so that liability may not be incurred by dealing with unauthorized concerns." "Don't be misled by evasive statements, and buy inferior goods, purporting to be manufactured under our patents. All patents of Jesse H. Bunnell, deceased, are owned and retained by his estate, and we are the only firm authorized to manufacture thereunder." They also made 40 to 50 percent price reductions to their steel lever keys and aluminum lever sounders in an attempt to lure customers from J. H. Bunnell & Co. The competition existed elsewhere too. Trade shows existed in 1900 not unlike the ones that exist today. At one such show for railroad telegraphers and buyers you would see one booth set up by J.H. Bunnell & Co. manned by Charles McLaughlin and John Ghegan displaying their product line. Further down the isle The Bunnell Telegraphic & Electrical Co. had their own booth manned by Dewitt Bunnell and at times was assisted by his mother Mary. (she was a familiar site at such shows) The two companies even competed in having the most popular souvenirs, which were complimentarily handed out to the men and ladies who stopped by their booths. The management team at J.H. Bunnell & Co. was very solid. Mclaughlin continued to use his expertise with commercial sales customers and John Ghegan essentially performed the duties formerly done by Jesse Bunnell. Ghegan, as an inventor, had the technical expertise, was well respected by the telegrapher and railroad communities, and his fluency in Spanish help to permanently establish business ties in Central and South America. The upper management at The Bunnell Telegraphic and Electrical Co., on the other hand was not as strong. The president of the company was 31 year old Albert Wise, a lawyer and a Yale graduate, who also maintained a lucrative corporate law practice in New York. Dewitt Bunnell, the general manager of the company, was only 23. Dewitt's career was tragically cut short during the first year of the company's operation. The Bunnell family suffered yet another loss as Dewitt died of typhoid fever in November of 1900. However, what the company did have was plenty of capital and a loyal group of skilled and experienced workers at the manufacturing level. Competing ads of the two Bunnell companies during the spring of 1900. In September of 1902, Albert Wise approached Charles McLaughlin and made an offer to buy his majority share of J.H. Bunnell & Co. It is unclear as to why Wise made the offer at this point except that the timing may of been right. McLaughlin was now 59, and had just lost his wife a few weeks prior to the offer. The offer was accepted by McLaughlin. The merging of the two companies took several months and at its completion McLaughlin went into retirement. By the summer of 1903 Albert Wise was now president of J.H. Bunnell & Co. and quickly made the smart decision to make John Ghegan his vice president and general manager. Wise's tenure as president, though, was short-lived. In December of 1903 Wise, then 34, died from complications resulting from a trolley accident which moved Ghegan into the presidency. 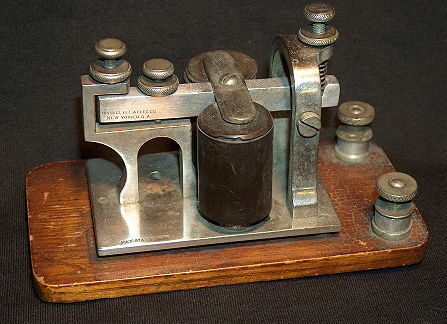 A nickle plated Bunnell Telegraphic & Electrical Co.
telegraph sounder marked Bunnell Tel.& Elec. Co.
" These eminently practical men form probably the strongest combination ever established in this country for the manufacture of telegraph apparatus." This opinion was based in part on the inclusion of one additional director, and his story represents an amazing part in this era of the company's history. In reading the 1904 announcement of the new officers, a somewhat confusing bit of information was stated. The announcement also stated that the new officers, "together with Jesse H. Bunnell" constitute the board of directors. as being manufactured between 1900-1904. 7-13-1901, 10-5-1901, 6-26-1902, 9-27-1902, 1-24-1903, 12-19-1903. 1-16-1903, 12-16-1903, 1-16-1904, 3-1-1904, 3-1-1905, 3-16-1907. Certificates of Incorporation, N.Y.S. Dept. of State, Albany, N.Y.